Guinee is truly a beautiful country. At the time of our visit it had only recently opened up to tourists so there was no hassle from locals or inflated prices for goods. We bush camped for free which was a real treat. The highlight though had to be the spectacular scenery throughout the country. The border was marked by a giant plaque and was an optimum place to stop for lunch. Immediately the difference between this country and Senegal was obvious. This country is relaxed. The scenery is beautiful - vivid green, butterflies galore, monkeys jumping out into the road and scattered coconuts on the ground. Border formalities were very slow. I have noticed in almost all of these countries that people have difficulty copying from print in the passport! Officially we required a "laissez passer" (pass) document at a cost of £20 but we thought our Carnet did the same thing. On closer inspection we discovered that the carnet does not cover Guinee and the border official told us we had to return to Dakar to buy the pass. Once we informed him that a Dakar detour would prevent us from coming back (visa expiry, impending rains) he agreed to let us carry on and fight it out at the next checkpoint. A bit of swift talking by Noel at the checkpoint 30 km further on got both of our carnets stamped and we were off again. The local people were generally fabulous. They are healthy, colourful individuals who look genuinely pleased to see us. 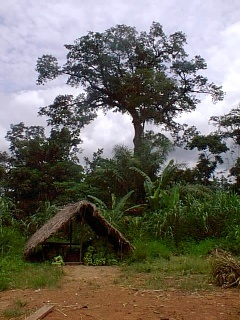 Guinee only opened its doors to tourists in 1994 so toubabs are not commonplace yet. Even requests for cadeaux were minimal. It had started raining a little but we prepared ourselves and the tent and set up a water collector using the roofrack cover. 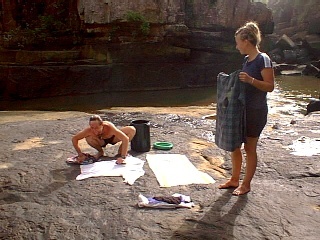 The collected water was used for washing ourselves, the dishes, the clothes and can top up the water tanks. I suppose this is one advantage of touring a country at the beginning of the rainy season. 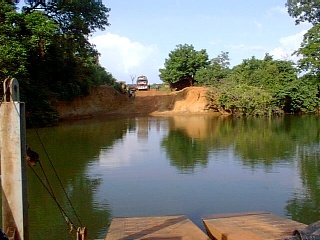 The piste road to Labe, the first town in Guinee took two days. 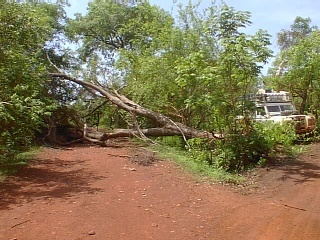 The road was no where near as bad as the Senegal route to the border but still posed a few challenges. The route was also regularly interrupted by checkpoints. Gendarmerie, police and customs did there best to slow us down by pretending our documents were not in order. Once they realised that they weren't getting a penny out of us they gave us oranges, laughed heartily and sent us on our way - mostly! Punda developed a clonk somewhere near the front right wheel. It is no surprise really. I would have been very surprised if any vehicle could get through the three days without injury. Giant avocados and giant mangoes can be bought here for 5p. What a treat and they are fabulous. There is none of this buy them at the supermarket business and wait a week for them to ripen. They are ready - and we are going to get fat on avocado! We treated ourselves to a 4 course dinner in the bush - what a glorious evening. However, our deep sleep was disturbed by the sound of the awnings taking off - poles being flung out of the ground and catapulted into the trees. The wind howled then the rain hit and we were drenched whilst gathering up the flapping bits of awning and finding the bits that were missing. Turtles awning is more rigid than ours and required a bit of bending back in the morning. Our poles needed to be straightened but there was no serious damage. 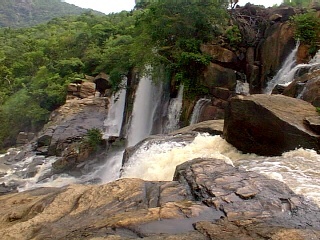 The area of Guinee known as the Fouta Djalon is beautiful. 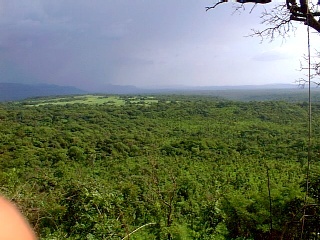 It is a high plateau of trees, forests and greenery galore. As it is high the temperatures are a welcome few degrees lower than we have recently experienced and there are few mozzies. 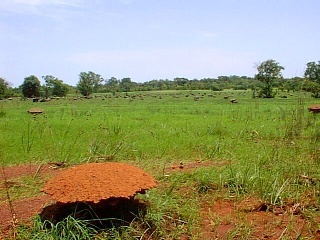 However, tsetse flies are a bit of a problem. Animals look really healthy here - they have lots of grass to munch on. It is commonplace for cows and goats to block the road - they just sit there and look at you as you try to squeeze past. Monkeys are also common and Andrew has had some fun playing peekaboo with them. This country smells of parsley. Houses are built to last here, unlike in Senegal. They have brick sides and proper roofs - no more temporary thatch work. At the markets in Labe we found loads of fruit and vegetables. We bought fresh peanut butter just pressed from groundnuts. A domodah would soon be on the menu. We tried these patti type things with chilli sauce but later regretted it when we all suffered from a "hot, wet" episode (Sallys expression)! Checkpoints are a bit of a bore. So far they have doubted our insurance documents and questioned why we don't have a photo permit (no longer required). It is at times like these that I get frustrated at my lack of French. It is impossible to argue or reason with some of these officials. They are only getting irate because they are after a bit of money, your first aid kit or a correspondence address in England. They think you will give in but we have time on our side. Once they know we are prepared to sit it out and if necessary make camp they wave us on quickly. Visited the Chutes du Kinkon - supposedly Guinees best waterfalls. We were disappointed but I suppose the rains have not really kicked in yet. 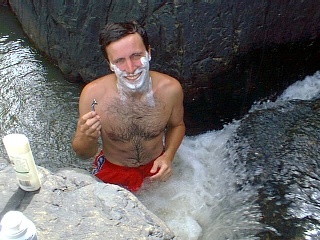 It did provide a washing opportunity (us and the clothes) and Andrew had a shave. After another night of bush camping we visited the Chutes Ditinn. 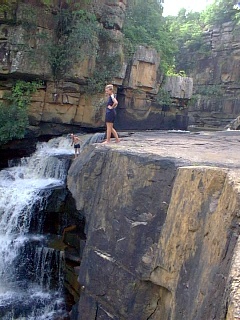 It is an impressive 80m waterfall visible from a few miles away. After a quick walk through the forest we reached the spray and then jumped into the water. We stood right under the flow and hoped that a canoe or tree didn't hit us on the head. Now I know what a house being pebble dashed feels like. We were surprised that the pool under the flow was only about 4 feet deep. This is quite a tourist sight and the local children were a bit of a nuisance - the "sticky factor" was high. They offer to show you the way or look after your car - all unnecessary, and will follow you wherever you go. Further down the water course we found a good place to sit and have a picnic and paddle. We wished our dads a "happy fathers day" and watched our mango skin boats shoot down the flows. We are keeping a lookout for a bridge to play "Pooh Mangoes". Bush camping is a real treat. We have found some superb spots among the greenery, next to streams and sometimes with fabulous views. The locals are more curious than intrusive and generally leave us alone after a "bonjour" and a quick look around the Landys. At Dalaba we decided to camp for a few days in the garden of the Hotel Tangama which was recommended by the Viking and Chief report. It was good to have some facilities and to get out of cooking for a few days. The hotel owner was incredibly welcoming and planned to charge us "a postcard from South Africa for each night stayed". 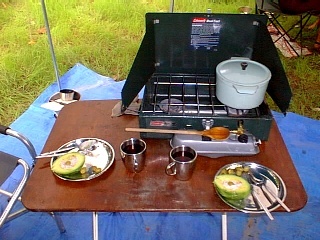 As cheap as bushcamping! I was sat reading in the hotel garden when I heard gentle tapping sounds. It turned out to be the pet tortoises up to naughties. It was fascinating - I have never seen tortoises move so fast. The girl was legging it around the garden with him on his back legs trying to maintain the pace. I couldn't watch for long as the other hotel guests were a bit prim (or pretending to be). The town of Dalaba was a delight to walk around. The locals ignored us and left us to get on with our shopping. That night we had dinner out - chicken and chips for £1.50. The next day before setting off I cut Andrews hair and were both surprisingly pleased with it. The result was probably better than what would have come out of the local "barbing" shops judging by the disproportionate pictures hanging outside them. We continued on our way south through beautiful countryside passing beehive shaped thatch houses and avoiding the cows and vultures in the road. This would be beautiful motorbiking country if there were less hazards in the road. Tinkisso Falls was our home for the night - an impressive set of waterfalls below a dam responsible for generating electricity for a number of nearby towns. Sadly there wasn't a place to swim but the camping spot in the middle of a teak forest was a delight. 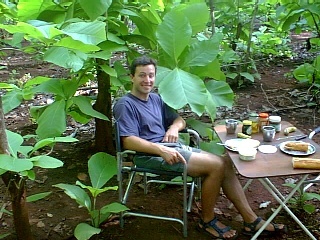 The leaves on teak trees are enormous - they could be used for shelter! The night was disturbed by numerous creatures munching on the vegetation around. I had hoped for something exotic but Noel's torch illuminated a herd of cows that quite happily chewed one of his flip flops and had their heads in the washing up bucket. In the morning Andrew saw a mass of monkeys quickly descend from the trees as he emerged from the tent. 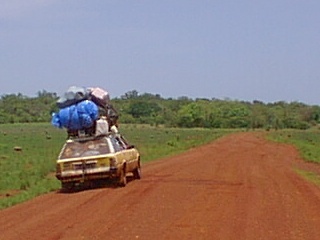 We hadn't travelled far when our journey was interrupted by a low pitched squeal. Roadside surgery revealed a ceased wheel bearing. 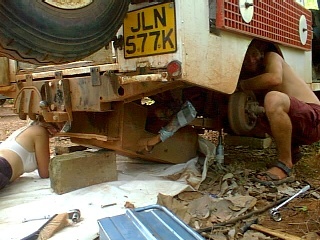 As we are in Africa we did what the Africans do - look at it, say dash, put a load of grease on it and put it back. It now appears fine but a new set of bearings is top priority when we reach somewhere where somebody knows what they are talking about. A spell of rain enabled us to pass through a checkpoint very quickly - it is a tactic that we will be using often. The gendarmerie, police and customs only seem to have one raincoat between them. The local children don't have coats and when it rains they strip off down to their undies and have a wash. The Hotel Savannah at Kissidougou allowed us to camp for free - just as well as we had to suffer the noise of their generator all night. When the generator stopped the cockerel started! However, the hotel restaurant served up the most delicious steak au poivre, saute spuds and cold Skol. We had eggs and a large audience for breakfast. The local children just stared in amazement as we prepared breakfast on the camp stove. A shopping spree in the market resulted in a 12p pineapple, a 10p coconut, 5p chillies and two 5p plantains. The locals were drying out grain of some sort in the street. They just spread it along the road and let the cars drive over it. If this is their drying method I now know why my Moroccan lentils contained more stones than beans. 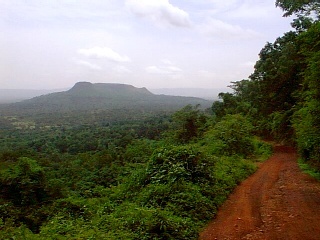 The region of Guinee Forestiere is the southernmost region of the country and in my opinion is the most spectacular. 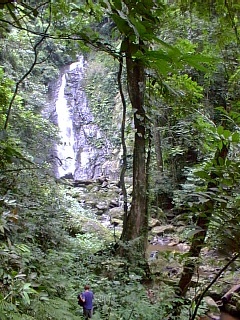 It is a vast area of tropical rainforest with breathtaking views. The area is in close proximity to the borders of Sierra Leone and Liberia and there are numerous refugee camps and aid agencies along the route. We found an area to camp out and the humidity of the area revealed itself that night in the form of mist - enough to make an impressive Dracula movie. It was really quite eerie having mist around palm trees. In the morning we took a sweaty walk in the sweaty forest and were delighted to find banana trees, coffee trees, bamboo and chilli pepper plants. I can appreciate why these items are so expensive in our shops now. The landscape is incredibly beautiful but is sadly starting to suffer the effects of deforestation. Pigs now line the road and the cows have disappeared. The guide book blames this on the lack of Muslims down here. Given the number of mosques (kindly donated by Kuwait) I am not so sure. 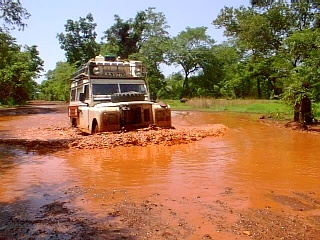 Advice from numerous sources had prepared us for the worst roads in West Africa. With the exception of some awful terrain near the Senegal/Guinee border the roads here have been fantastic - decent tar and superior road markings and signs. We wanted a bit of a challenge so decided to take the long way round to the border via the "diamond route". 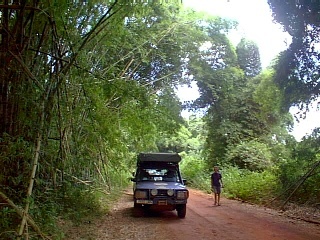 It is a 100 km stretch of piste running initially through the forest then emerging out on the Malinke Plains. The road was absolutely fine (the book said it would be practically impassable) and took us through the most incredible scenery. Every day I am amazed by the beauty of this country. The coffee and banana industries are big here and we were able to buy bananas on the roadside that had just been picked. We bought 24 for 15p! 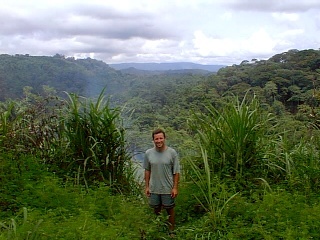 Found a great camp spot half way along the piste and set off on another trek through the jungle. The elephant grass was enormous - bigger than us. That night we watched thunder and lightening pass us by with a trickle of rain. It was not what I wanted as I was stood outside the car in the nudie desperate for a shower. We ate plantain curry for dinner made with the fresh coconut and chillies bought at the market. This is definitely a dish I will be making again soon. The goats and sheep look the same out here. I think there is as much interbreeding between the animals as the people. The sheep/goatie things look really funny in the rain as they huddle together under the thatched roofs of rondavel type houses. Punda had a head -to-head with one of these animals as we headed up a hill. It was the last confused one of the herd and decided to run towards the car rather than to the roadside. When it realised its impending doom it locked its front legs and came skidding down hill to a halt. I don't know which was funniest - the look of terror on its face or the smoke from its hoofs. We stopped off at a town and were treated with a great deal of trepidation. I don't think they had ever seen "white man" before and everyone stared at us and stopped doing what they were doing. The feeling was so intense that we bought bread and legged it. 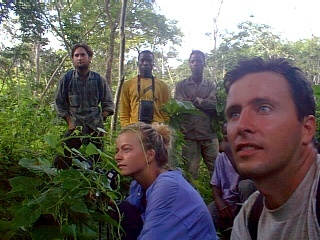 At the village of Bossou we camped in their school grounds and were up at 6.30am to go chimpanzee viewing. A research project was set up 20 years ago to protect and monitor these animals. Our guides were the usual bunch of teenagers but they were very good. 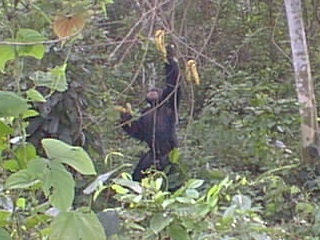 The chimps were incredible - they were so close (4 - 5 feet). We were so excited to bursting point and it has renewed our desire to visit the mountain gorillas in East Africa. Bananas were of course the incentive for the chimps to get so close and we did get to have a good look at them - including "dad" who posed for a full frontal! Such beautiful animals - it was worth digging out the alarm clock, wouldn't have missed this opportunity. 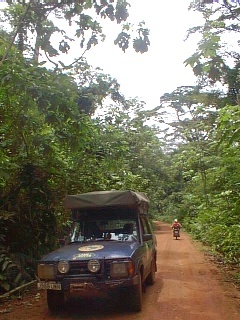 The final 20 km to the border took us past the spectacular Mont Timba and through bamboo forests. Bamboo grows to an enormous height and their leaves look like giant feathers from a distance. The border formalities were really slow and we were relieved when they finally stamped us out of the country despite close scrutiny of the paperwork. 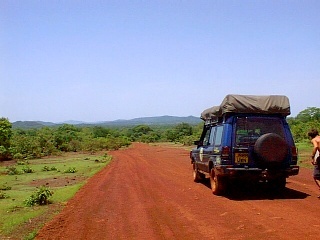 Phew, we had made it through Guinee with incorrect papers - each checkpoint was a worry. We were also sad to leave because we have had a fantastic time. Guinee is a beautiful country full of beautiful people and we are privileged to have been able to visit at a time when tourism and environmental damage is minimal. Much of Guinee cuisine is similar to Europe. There is a lot of chicken and steak served with chips. 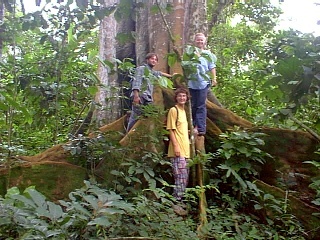 The avocados are superb along with enormous mangoes, fine bananas and delicious plantain. It is possible to buy sweet potatoes, onions and aubergines in the market but very little of any other veg. It is common to buy eggs that are either raw or cooked. Most of the locals speak languages other than French (a few words in French) so you are not really sure what you are getting. I boiled an already hard boiled egg. 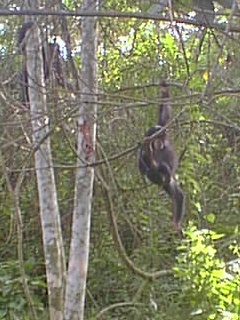 Bossou - chimpanzees. Camped at Chimpanzee Project buildings next to playing field. Ensure all documents are in order. The Carnet de Passage does not usually cover Guinee and one is required to buy a "Laissez Passer" document with the visa. This is available in Dakar, Senegal. Check the car insurance is valid too. Guinee is trying to integrate into CFA currency. It currently has its own currency - the Guinee Franc - which is easily exchanged with the CFA currency but at a variable rate. It is possible to buy most things with CFA so it is not worth having much Guinee money, particularly as it is a closed currency and officially not allowed to be taken out of the country. Make sure you understand your "cinquante francs" and your "cinq cent francs" otherwise you may end up paying 10 times too much. Tourism is a very new industry and most of the locals are more interested in their SW radios than they are of tourists. In the markets it is possible to get all types of medications, even contraceptive pills, just off the shelf. One crushed papaya leaf, brewed to make tea is sufficient for four people as an anti-malarial and as a malaria treatment. One drink taken twice per week is said to prevent malaria, whereas one dose per day is taken as a treatment. Much of the population in the southern region are refugees from neighbouring countries, hence speak English. 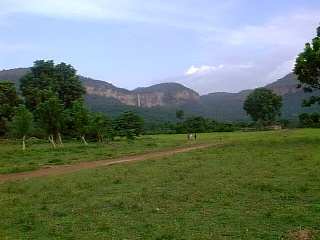 Guinee is divided into four geographical regions: Basse (similar to the Basse Cassemance area of Senegal), Moyen (means "middle" but describes the area around the high Fouta Djalon mountains), Haute (strictly means "high" but these are the flatlands of the Malinke Plains) and Forestiere (the southern tropical rainforest region).